On so many occasions over the years, Helen and Theo Gobat watched as their son Ollie dived into the waves at Smugglers Beach in St Lucia, his favourite swimming spot at the edge of the Caribbean Sea. For one last time this week they accompanied him there again, wading into the water to scatter his cremated remains and bid him farewell. For a few poignant minutes, a rainbow appeared offshore. In the seven months since Mr Gobat was murdered, his family has struggled to come to terms with not only the horrific circumstances of his death but the elusiveness of justice and the realisation that their once relatively carefree lives – split between their homes in Esher, Surrey, and the Caribbean – have forever changed. “Some days I’ve been so down I thought of getting rid of myself. It hurts so much you just want to obliviate, but I realise I can’t cause any more grief for my family and I’ve had to move past that,” reveals Mrs Gobat, 66. Mr Gobat, 38, a hotelier with a reputation for integrity, was shot dead in April in an apparent contract killing linked to a possible business rivalry. His face stares out from posters taped on walls and doorways around the island, publicising a reward for information leading to his killers’ convictions. His family’s decision to go public this week with their concerns about investigative inadequacies in St Lucia, and to confront the British government’s refusal to send police to the island to hasten the hunt for the killers, was not taken easily after seven months of restraint. There have been tears of worry and sleepless nights. “It’s time to speak up. We’ve been too polite and too British about it. Our son was murdered in horrendous circumstances, and then we have to deal with all this rhubarb and frustration,” says Mrs Gobat. Her husband Theo started a hotel development business on St Lucia 42 years ago and was at one point the second biggest employer on the island after the government. In 2008, the couple opened Cap Maison, a luxury boutique hotel, with Ollie and his brothers Rufus, 45, and Adam, 41. “Ollie was our best friend as well as our brother….we feel like we are walking around with a piece of us missing the whole time. It has affected our parents terribly,” said Rufus, a father of two. There is also fear of what they may be up against. Even Mr and Mrs Gobat’s arrival on St Lucia last week had to be finely choreographed; no taxi driver at the airport holding up a sign with their name on it; an armed bodyguard to keep an eye on them. “How do we know that the same people aren’t coming for us?” she said. “We spent winters here in our dotage and I just don’t feel it’s so sweet right now, I’m not sure I want to be here and I can’t say for sure that our sons are safe to come back in. 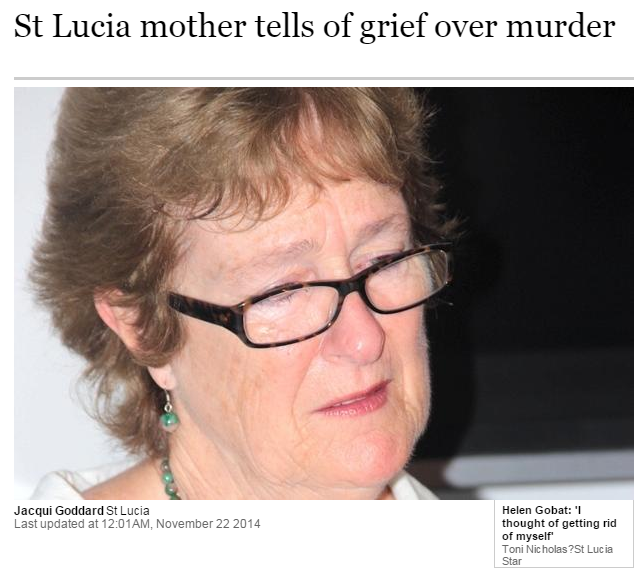 Mr Gobat’s murder was one of more than 400 committed on St Lucia in just the last ten years. The majority remain unsolved. A British couple fighting to bring their son’s murderers to justice in St Lucia yesterday announced a reward for information, describing it as their “last throw of the dice” after the governments of both countries left them to solve the case themselves. Helen and Theo Gobat said that a lack of police resources in St Lucia meant that an official investigation had barely got off the ground in the seven months since their son Ollie, 38, a hotelier and entrepreneur, was shot by contract killers. The British government has refused to send police to investigate because of its opposition to the death penalty, which St Lucia — a member of the Commonwealth — retains for murder. “Getting justice for Ollie is like pushing water uphill,” said Mrs Gobat, of Esher, Surrey. Mr Gobat’s death is one of hundreds of unsolved murders on St Lucia. The family has so far spent more than £100,000 on bringing in an external forensic science team to recover evidence missed by police and on launching a private investigation headed by a former member of the UK’s Serious Organised Crime Agency. His efforts have turned up critical leads, brought forward witnesses and suggested potential persons of interest. Conducted in the face of intimidation and death threats, the private investigation has suggested that Mr Gobat’s legitimate business relating to a luxury resort called The Landings may have ruffled feathers in the criminal underworld. “This is serious and organised crime, a contract killing,” said the investigator, whose three decades of service in British law enforcement also included stints in Scotland Yard’s elite special patrol group, anti-corruption squad and regional crime squad. “But this case is solvable, it’s do-able, and we’re going to keep fighting,” he added. Mr Gobat survived cancer as a teenager and went on to pursue successful business ventures that included co-ownership with his parents and two brothers of St Lucia’s exclusive Cap Maison hotel. The family has created thousands of jobs and brought millions of pounds in investment and tourism to the Caribbean island over the last 42 years. Mr Gobat’s burning Range Rover, containing his burnt body, was found on an unpaved track on the Cap Estate on April 25. He had been shot in the head. Police removed the body from the car, and the car from the crime scene, within hours, with minimal forensic examination. The crime scene was not sealed off and there was no public appeal for witnesses. 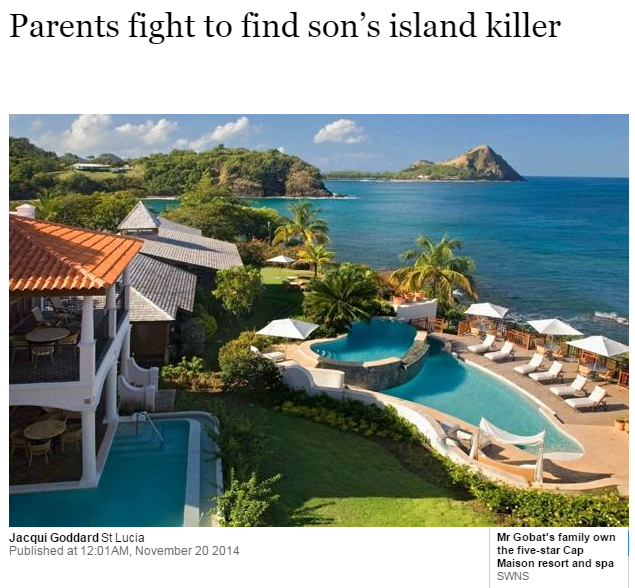 The St Lucian government asked the Foreign Office in July for help from British police. However, there is reluctance in Whitehall to get involved in the former British colony’s law enforcement process because the death penalty is still the statutes. Peter Foster, QC, speaker of St Lucia’s House of Assembly, said: “We feel the British have forgotten us in St Lucia. We need help with our police force, serious help. The Gobats estimate that their private investigation could ultimately cost as much as £500,000 and fear that their efforts to uncover the truth about Ollie’s murder has also made them and their other two sons potential targets. They now travel with protection. “I never imagined I’d have to go swimming at a beach where I’ve been swimming for 30 years with an armed bodyguard,” said Mr Gobat, 75. Local and international business and tourism contacts have contributed to a reward fund of 250,000 Eastern Caribbean dollars — about £60,000 — to bring forward leads and witnesses. St Lucia’s prime minister has dismissed as “improper” Foreign Office demands for him to waive the death penalty in the case of murdered British hotelier Ollie Gobat, amid a diplomatic stand-off between the Caribbean island and its former colonial ruler. 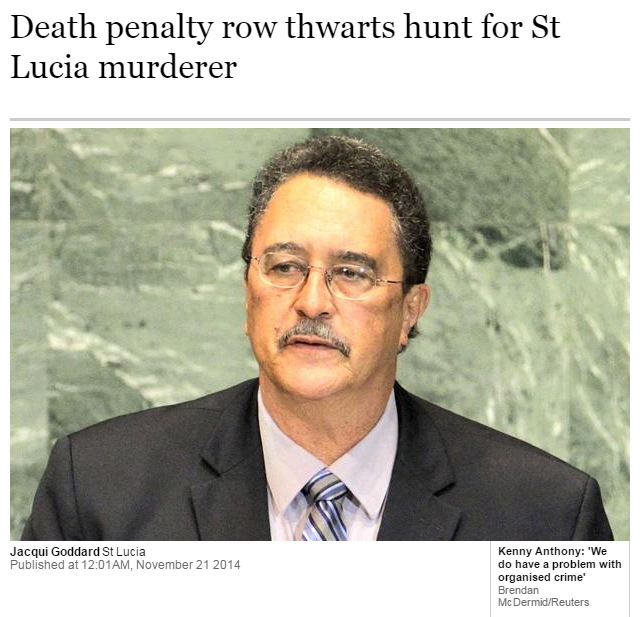 In an exclusive interview with The Times, Kenny Anthony said that he supports a request from Mr Gobat’s family for British officers to assist the murder hunt, but not Whitehall’s stipulation that it will only send a squad if St Lucia guarantees that it will not seek capital punishment for his killers. The Caribbean island secured independence from Britain in 1979 and is one of 28 Commonwealth nations that retain the death penalty. “The problem sometimes with the British government is that they have forgotten the constitutions that were fashioned for us (at independence),” said Mr Anthony, speaking at his official residence in Castries. Mr Gobat, 38, was ambushed while driving his Range Rover on the Cap Estate in St Lucia and shot in the head. His vehicle was then torched, with his body inside. A private investigation commissioned by his family and conducted by a former British police officer who was formerly a member of the Serious Organised Crime Agency has uncovered evidence that points to him having been the victim of an international contract killing. The family’s frustration at a lack of progress in the official investigation has been compounded by the British government’s refusal to get involved because of its concerns for the perpetrators’ human rights. Though prosecutors have the right to seek the death penalty in St Lucia, the last hanging was in 1995 and the UK-based Privy Council – the ultimate court of appeal – has historically commuted every death sentence to life since Britain itself abolished execution in 1965. The British government’s insistence on it being taken off the table as a pre-requisite for sending police to the island is therefore seen as moot. “Their preoccupation with hanging is very misplaced. Their own Privy Council makes sure that the death penalty never gets carried out,” said Mr Anthony. Mr Gobat’s parents, Theo and Helen, of Esher in Surrey, have lobbied the Foreign Office to break the impasse, assisted by their MP, Dominic Raab.